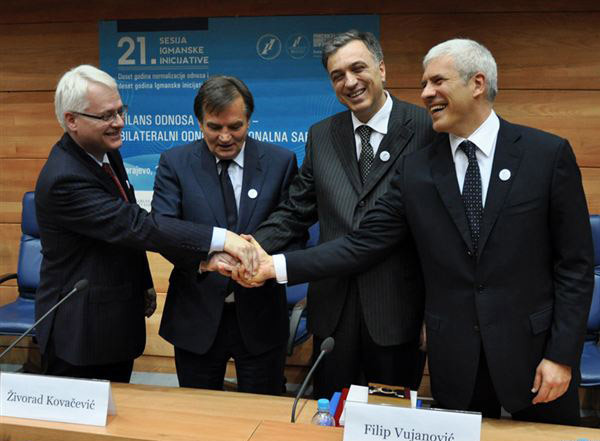 The 21st session of the Igman Initiative was held in Sarajevo with the participation of heads of state of Serbia – Boris Tadić, Montenegro – Filip Vujanović, Croatia – Ivo Josipović and the presiding of the Presidency of B-H – Haris Silajdžić, marking its 10th anniversary. At the beginning of the session, participants were welcomed by the Mayor of Sarajevo Alija Behmen and Head of the Delegation of the European Union to Bosnia and Herzegovina, Dimitris Kourkoulas. Following that, co-presidents of the Igman Initiative, Vehid Šehić, Aleksandar Popov, Zoran Pusić and Branko Lukovac addressed the participants. A member of the regional board of the Igman Initiative Youth Forum, Srđan Vezmar, also addressed the Sarajevo session participants, presenting activities conducted until then in establishing the forum and plans for the forthcoming period. For more on the topic, see special news. President of Serbia, Boris Tadić stated in Sarajevo that in the last ten years an exceptional progress was made in the relations among peoples and countries, adding that the European Union might take that fact into account in the enlargement process. “Peoples in the Western Balkans are the closest to each other”, said the Serbian president in his address to the leaders of the countries of the region. “At that time, there were no normal relations among the peoples on the territory of the former Yugoslavia. Borders were closed and countries did not have normal diplomatic relations. It was difficult even to think of going to our capitals and establishfriendship and links”. “That is why I believe that an exceptional advancement was made in the previous ten years, just as I believe that the European Union should appreciate that”, said the president of Serbia. He added that he was aware of a certain enlargement fatigue felt in the EU due to the financial crisis and pointed out that it would be an immense and irreparable damage to have a halt in the process of EU enlargement to the Western Balkans. “That would have tragic consequences on citizens of the Western Balkans. Consequences of the crisis must not be paid by the citizens of our countries “, stated Tadić. He invited his counterparts from the region to send a clear signal from the meeting to their European partners that the enlargement policy was to be proceeded with at any cost. 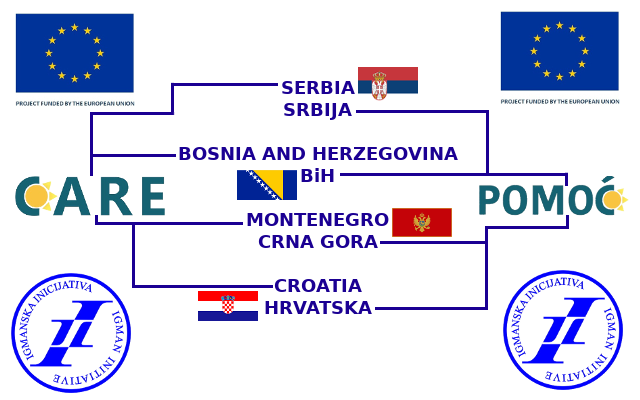 President of Croatia Ivo Josipović invited all leaders in the region of the Western Balkans not to give up their common European future and promised Zagreb’s assistance to all its neighbours in the European integration process. President Josipović made a remark that it was courageous to initiate the reconciliation process at the time the Igman Initiative commenced its activities. “That vision is has come true and we all share the same efforts and ambition. Our EU membership in the near future is not a reason to turn our back to neighbours. Contrary to that, everyone want good neighbourhood “, concluded President Josipović. He pointed that Croatia would, once an EU member, continue to assist countries in the region and encourage their membership in all international organizations. “The secret is in goodness, wisdom and courage to be above the cynicism of daily politics and make a step forward towards the future. 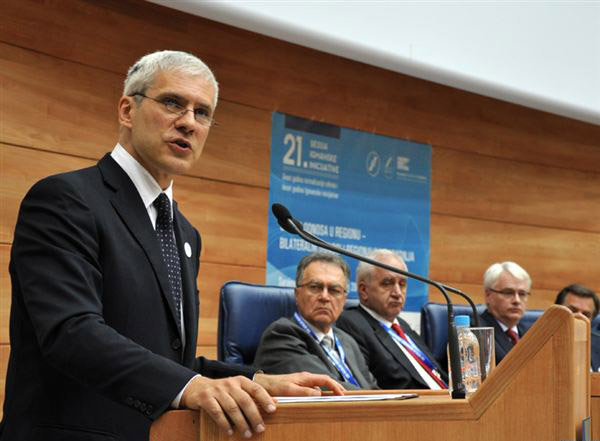 The Igman Initiative made that possible by becoming active amidst the war in B-H “, said President Josipović. He stressed that stability and welfare in B-H were a vital interest of Croatia. “Let’s hold our hands and speak with one voice for the European B-H and European region “, said President of Croatia. Josipović invited leaders of the region not to give up the common future and stated that problems those countries were facing were temporary. “We must learn lessons from the wars waged in this region “, said President Josipović, adding that an important task of the regional leaders was that of reinforcing peace and making compromises. The presiding of the Presidency of B-H, Haris Silajdžić stated that the objective of the Igman Initiative was clear and unambiguous, directed towards support and promotion of local and regional dialogue in the sphere of politics, economy, education and culture. In his address to the participants of the 21st session of the Igman Initiative, Silajdžić pointed out that the aim of the gathering was to encourage countries of the region to contribute to a fast and meaningful normalization of relations among B-H, Serbia, Montenegro and Croatia. He stated that a dialogue on all outstanding issues was also necessary, particularly on the absence of trust as a major impediment in the region. 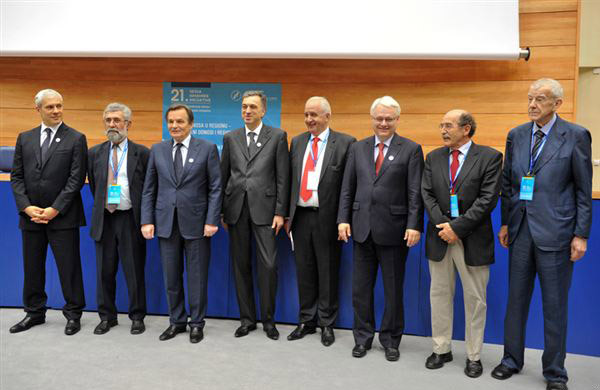 “Trust is the most important factor in our relations”, said Silajdžić, inviting presidents of Serbia, Montenegro and Croatia to concretize Igman Initiative ideas and set up joint teams on the high level to get involved in establishing and cooperation of scientific and research centers in a number of areas. Silajdžić expressed hope in the success of humanistic ideas promoted by the Igman Initiative, adding that it had been proven in this region that nothing could be achieved by using force”. In his opinion, all issues could be resolved by dialogue, and the common opportunity offered by the Igman Initiative concept would be taken in the region in the best way. President of Montenegro Filip Vujanović stated in Sarajevo that the main condition for the progress of the Western Balkans was linking of the four countries – Bosnia and Herzegovina, Serbia, Montenegro and Croatia. Vujanović also pointed out the necessity of establishing links in sport, art and culture in which the contribution of the civil sector was significant. President of Montenegro added that the Igman Initiative as a network of civil sector representatives should be committed to the strategic objectives of all countries – fostering neighbourly relations and regional cooperation. “The European integration is a common objective of all our four countries. We live in time in which genuine values are to be cherished and there is no actual success without regional cooperation”, said President Vujanović, adding that under such circumstances it would be easier to establish the economic cooperation. President Vujanović stated that conflicts in the Western Balkans were a consequence of disrupted inter-ethnic and inter-confessional relations. In his words, that was why values of socialism should be preserved, being “the values of anti-fascism and inter-ethnic and inter-religious harmony used to be called brotherhood and unity “. Presidents of the four countries arrived to the Parliament of Bosnia and Herzegovina one after another, in 20-minute intervals, but they entered the conference room together, demonstrating unity which was the purpose of that regional meeting. 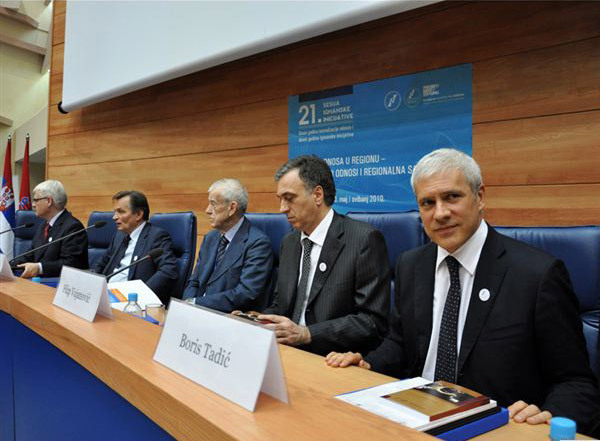 Letters of a member of the Presidency of Bosnia and Herzegovina, Nebojš Radmanović and former President of Croatia, Stjepan Mesić were read at the conference. Radmanović stated in his message that conferences like the one organized by the Igman Initiative could contribute to the stability of the region. In his words, ideas of the Igman Initiative were always supported in the countries of its members as they were realistic and practical, suiting the needs of citizens. Mesić stated in his letter that 10 years ago, normalization of relations in the region was only a dream, whereas then it was a reality. In his opinion, great progress had been made in facing the past and the time had come to move on. 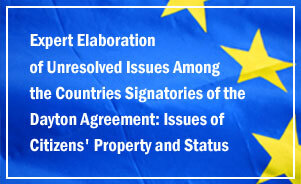 At the end of the Igman Initiative session, the participants adopted a joint statement. We are confident that the European prospects are a driver and guarantee of peace and stability in the region of South-East Europe, stimulating bilateral cooperation aimed at the improvement of mutual relations to the benefit of all our citizens”. The Sarajevo Igman Initiative session was held with the support of Friedrich Ebert Foundation, Fund for an Open Society and European Fund for the Balkans.